A new website can give your business a boost, especially when it is properly planned, well-written, and has sound SEO foundations. Concentrating on good content and user experience can provide a huge improvement in both rankings and conversions, but relying on the new site alone isn’t enough for sustained growth and improvements. Here are 6 things every business should do once a new website goes live. If you’ve read anything about digital marketing, you’ve probably come across the phrase Content is King over and over again. Content is why people come to your website – whether it’s advice, entertainment, or industry news; you need to provide some sort of unique value in your content. Most websites go live with fewer pages than they should ideally have – building out your content to complete your site plan is a great way to maximise your ranking opportunities. Your blog is another area that needs continual updates – whether you blog daily, weekly, or monthly, it’s important to add fresh content to your site. It encourages Google to re-crawl your site regularly and gives people a reason to keep coming back. Even better, it gives you a good reason to regularly link back to your site from social media and offer followers more value than a 140 character post or Facebook status update. Social media is incredibly valuable for businesses. We always advise against embracing every single platform – it’s better to be realistic about your resources and where your audience is in order to concentrate on 1-3 platforms where you can really add value. Updating frequently with your own news and curating content are both ways to encourage followers to follow your brand, interact with your content, and to keep your business at the forefront of their minds. A quality presence on social media means that you can encourage repeat business (which typically costs less per acquisition than first-time customers) and improves customer loyalty. Using directories intelligently can help you improve your local rankings and even get traffic to your site. While directories have been overused by SEO professionals over the years, some still provide value and offer Google more information about your business or brand. Fortunately, many of these quality directories are free and just require a little time to add your business. As well as local or industry directories. Reviews build trust and show potential new customers that you have a reputable business. Now that anybody can build a website and establish a web presence fairly quickly, users want the reassurance that you know what you’re doing and that they can trust you with their money and personal information, as well as whatever they’re buying from you. 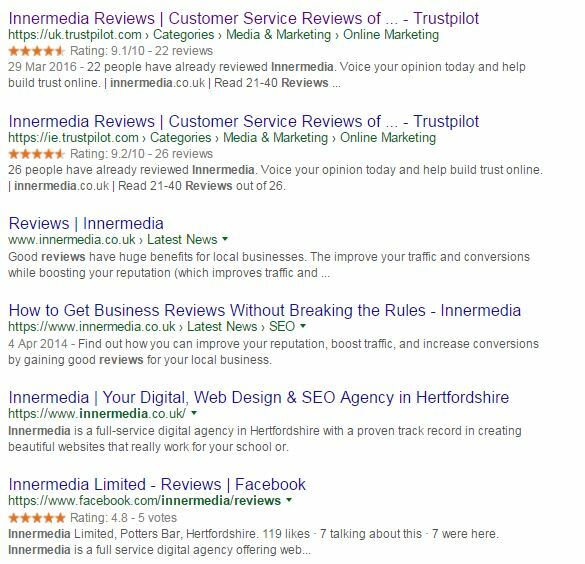 Building reviews in the right places can give potential customers a positive impression of your business right in the search results – you can see that Innermedia’s profiles have gold stars in the SERPs to show that our customers trust us and value our services. SEO is a fantastic way to gain customers – you get a long-term return on your investment and conversions are typically far cheaper than those that you get from advertising. However, it’s always worth looking into your advertising options to see if you can give your visitor numbers a boost. There is more to the online advertising landscape than just Adwords. We’ve found that a lot of customers have recently been priced out of Google Adwords and are looking at other options, namely social advertising. For just £50 you can get over 1000 clicks and reach your key demographics – we have seen CPCs* as low as £0.03 on Facebook, with CTRs* of over 19% and excellent conversion rates. 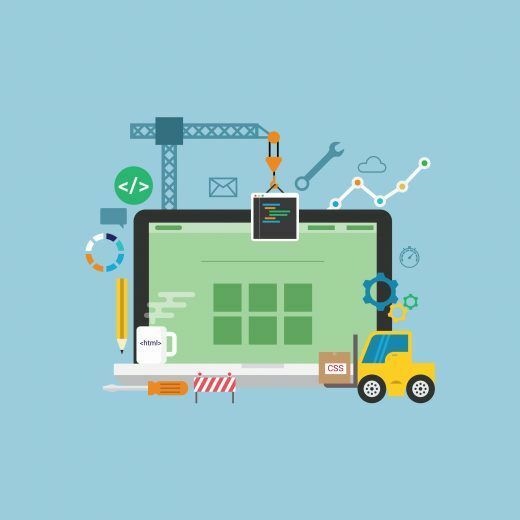 Installing and checking on your Google Analytics is essential to knowing what your site is doing right and what it’s doing wrong. You can see information such as number of hits, visitors, and the amount of time they spend on your site, as well as details like the most popular pages, where traffic is coming from, and what people look at before they convert. This is essential to maintaining a healthy site an making improvements that reflect what your customers want. If you’d like help taking your site to the next level, get in touch. We have great results with SEO, PPC, and creating effective digital marketing strategies. Just take a look at our portfolio to find out what we could do for your business. *CPC = Cost per Click, CTR= Click Through Rate. Adwords averages are around £1-2 per click (in our experience) and 1-3% CTR.